We were as gripped by the London 2012 Olympics Opening Ceremony as anyone else. It had a distinctly classical music flavour and, with The London Symphony Orchestra, Daniel Barenboim and Sir Simon Rattle appearing, it was an event to be proud of. 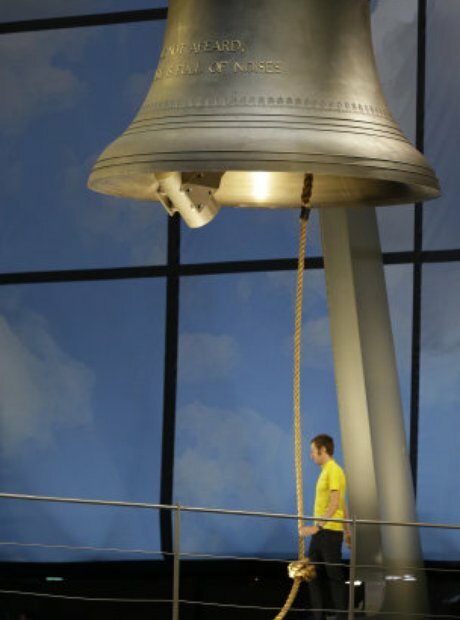 Tour de France champ Bradley Wiggins kicks off the London 2012 Opening Ceremony by ringing the Olympic bell. Recent Tour de France champion and British cyclist Bradley Wiggins strikes the Olympic Bell to begin the London 2012 Opening Ceremony. The celebrated actor played a central role in the Opening Ceremony of the London 2012 Olympics. A spectacular firework display takes place over the London 2012 Olympic Stadium during the Opening Ceremony. A different perspective on one of the greatest Olympic opening ceremonies in history. In a dazzling production, Artistic Director Danny Boyle tells the story of the UK - from pastoral scenes, through to the industrial and digital age. As a climax to the London 2012 Opening Ceremony's 'Industrail Age' scene, five Olympic rings float into the sky from a forge. Following his hilarious rendition of Chariots Of Fire, conducted by Sir Simon Rattle, Rowan Atkinson takes a bow. The LSO played a brilliant - and hilarious - role at the London 2012 Opening Ceremony. Rowan Atkinson brings the house down as his comic character Mr Bean joins in with the LSO for a rendition of Chariots Of Fire. A huge light show and spectacular fireworks defined an amazing night. In a ceremony celebrating technology and the digital age, a British house plays host to the technological developments over the past few decades. Among one of the most touching scenes, a dancer is hoisted towards the sun. The Olympic stadium is lit up during the Opening Ceremony. The Beatles' Yellow Submarine makes an appearance at the Olympics. Another dazzling scene as Artistic Director Danny Boyle spectacularly signals the arrival of the Olympics in London. An extraordinary ceremony is crowned by a huge firework display. An incredible light show illuminates the incredible Olympic Stadium in Stratford. A dazzling firework display lights up London. In a tribute to the sterling work of the NHS, its workers, some patients of Great Ormond Street Hospital and dancers paid tribute to their tireless efforts. After Lord Sebastian Coe had addressed the London 2012 Olympic Stadium, Her Majesty the Queen officially declared the Games open. Sir Chris Hoy proudly leads the British athletes set to take part in The London 2012 Olympics over the next couple of weeks. Sir Chris Hoy leads out Team GB at the London 2012 Opening Ceremony. Daniel Barenboim is among those selected to take the Olympic Flag in to the London 2012 stadium. Before the lighting of the Olympic Cauldron, Lord Sebastian Coe addresses the stadium. Members of the Armed Forces march the Olympic Flag to be raised above the London 2012 Stadium. The venue for much of the track and field events is lit up with fireworks. Following much speculation over who would light the Olympic Cauldron, SIr Steve Redgrave passes the torch on to seven young British athletes, who finally signal the official beginning of the London 2012 Olympic Games. The games officially get underway.